What lots of people did not know in the 1980s when American Sports Cavalcade started covering swamp buggy recession Naples, Florida is that the “sport” has started long before the television cameras showed up. At first it was hunting buggies that were raced and then as the years went on the machines got more specialized to deal with the famed “Mile O’ Mud” course in Naples complete with its famed ‘Sippi hole and all. In this video from 1966 we’re seeing some highlights from the 14th annual races. Yes, 14 years under their belt by the time they got to 1966. If we had to guess it looks like we’re seeing the “little feature” and the “big feature” races here. Those two runoffs are determined by the different class winners throughout the day. The fast stuff is in the big feature as well as the winner (and maybe the runner up?) of the little feature. That’s if we’re remembering this right. Anyway, the point of the exercise here is he vehicles which range from Jeeps with larger tires to some really awesome looking homebuilt creations, including one that looks like a stage coach. The vehicles in the first grouping are definitely the slower of the bunch. The stuff in the second group actually has some of the look of a “modern” swamp buggy racer in terms of where the driver and engine is, etc. There’s lots of people watching, lots of fun being had, and lots of really cool iron in this short newsreel clip. If you thought you had see it all with regard to swamp buggies you hadn’t! 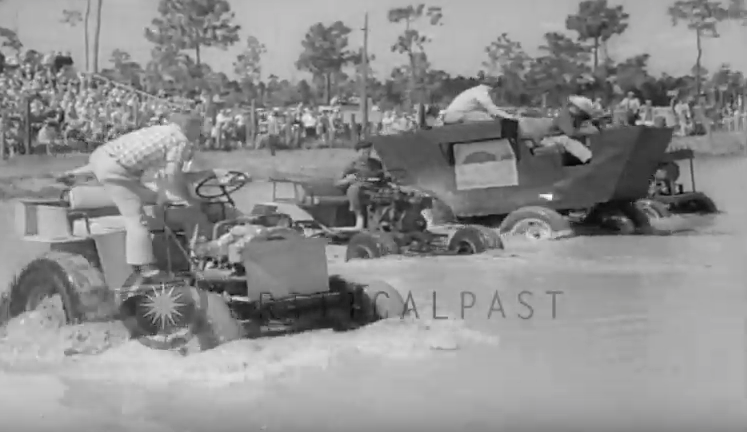 Press play below to see historic swamp buggy racing video from 1966! Happy Birthday To The BUFF! The Boeing B-52 Stratofortress First Flew On This Day In 1952! Monday Shopper: 1971 Ford Mustang Boss 351 - When You Want To Mess With Everyone's Head!